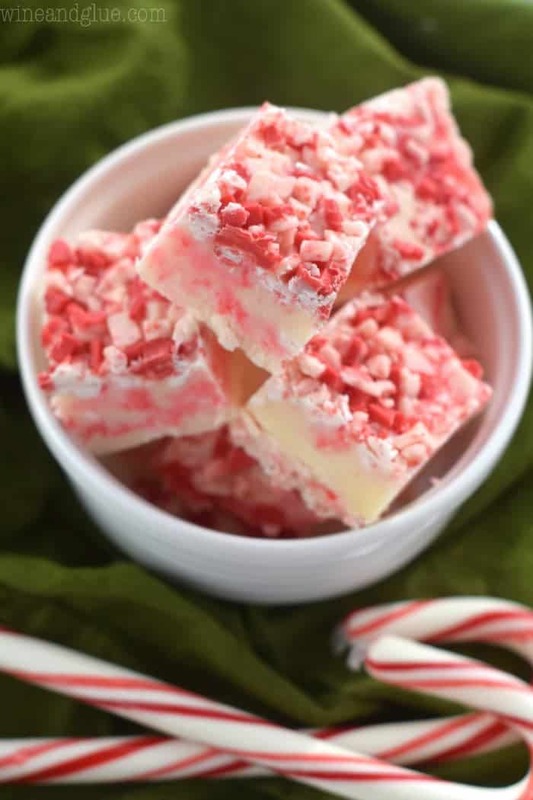 This Candy Cane Fudge is super easy, and a fun holiday treat! Have you ever noticed that holiday stress, travel, family craziness, messing with kids’ sleep schedules, and cold and flu season all fall at the same time? It’s like the universe wants me to drink a few glasses of wine every day in November and December. A nasty cold has hit my house, and it’s like the younger the kid the harder it hits. It lasted one day with Gavin, and with a little medicine, he was good to go. About three days with Quinn, and when she was on the juice, it was like she wasn’t sick at all. We are going on six days for little miss Piper. She is like my sad little baby with her tiny terrible cough, her runny nose and her gunky eyes. And yet we dragged sad little sick baby to three Thanksgivings . . . Holiday stress, travel, and sad sick babies. It’s the trifecta of evil. So this fudge won’t make sad little sick babies any less sick, but it will help their moms feel a little less stressed. This is a holiday treat that comes together fast fast fast. I made this in about 10 minutes before I was running out the door to a dentist appointment. No kidding. In addition to being fast, this fudge is delicious! 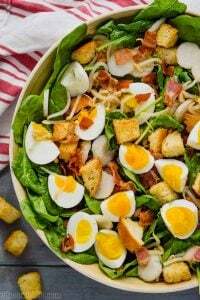 I used the Ande’s Peppermint Crunch Baking Chips to top this off. 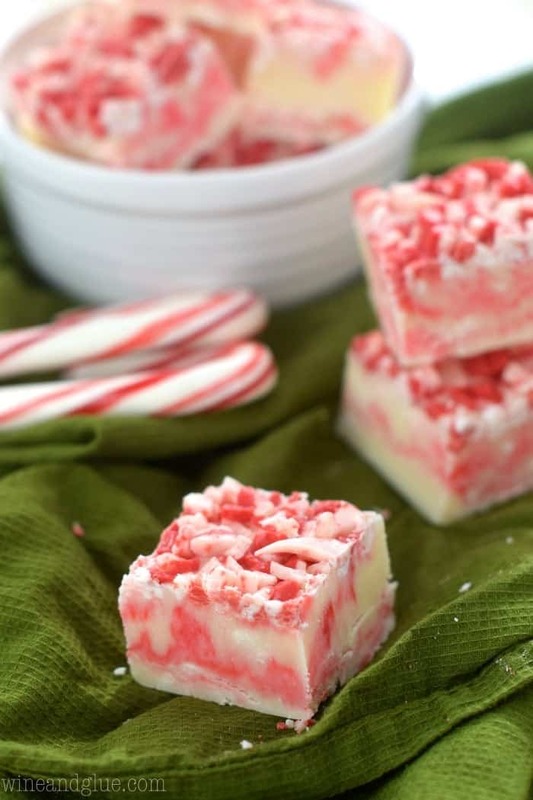 It gave the gorgeous look of crushed candy canes without the weird crunch. I’m pretty sure they are my new favorite baking item for Christmas. 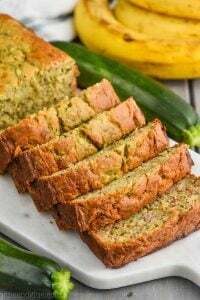 One thing to note about this recipe is that you need to move fast. 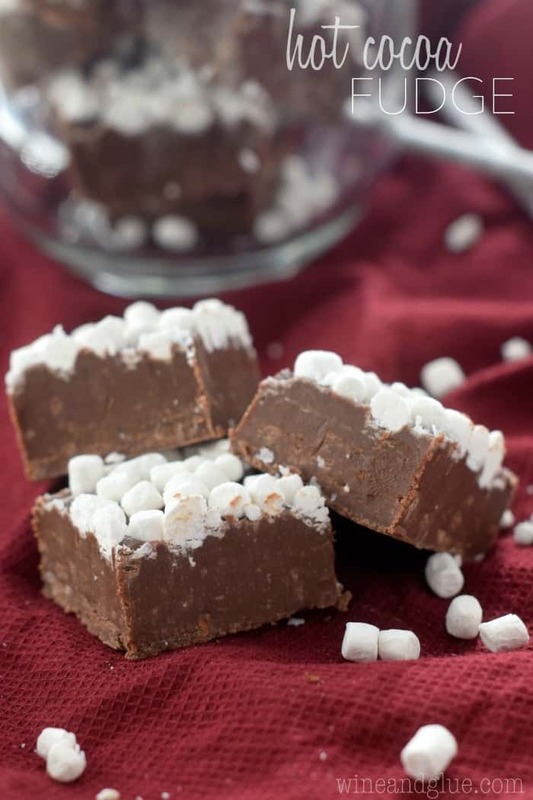 This type of fudge sets quickly, and because you are putting the red part in the middle of the fudge, thereby pouring in half at a time, you need to move fast. Make sure you have all your ingredients lined up and ready to go and your pan lined with aluminum foil before you start melting your white chocolate. Also, white chocolate can be really tricky to work with. 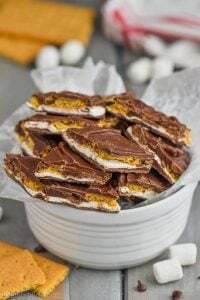 I have some tips about it in my Mint Oreo Bark post. This post contains affiliate links, thank you in advance for supporting Wine & Glue! 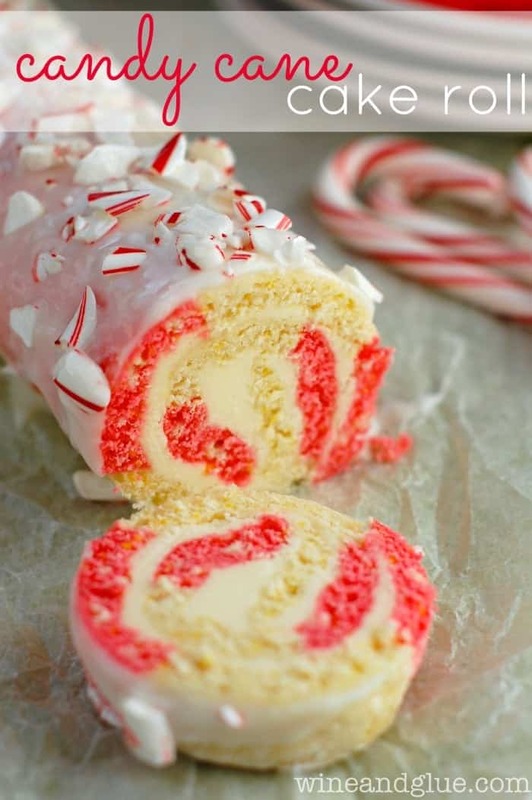 This is so perfect, I’m a sucker for the pink and white swirls — and they just had a 2 for 1 special on candy canes at my grocery store, so I’m set to go! Seriously this is amazing!!!! I had to pin right away! This fudge is too gorgeous, Lisa! Sorry about all the sickness in your house, but it’s totally that time of year. The mint is good for sinus clearing! I hope you like it Liz! Sick babies are the worst! I’m so glad it was acceptable to give Jordan medicine back then. On a happier note, this fudge ROCKS! I hope everyone likes it Dorothy! The red food coloring is just a judgment call. I did about four drops per layer. And I definitely would not recommend using a regular candy cane. It’s going to give the fudge a crunch on top that for me would totally throw off the texture. Though I know plenty of bakers who are cool wit it. I can’t find Andes peppermint crunch chips anywhere. What could I substitute? 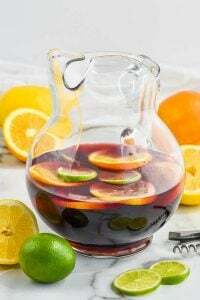 I would love to make this for the holidays! Cathy! Say it isn’t so!!! Okay, give it one more shot at Target. They are found in the baking aisle by the chocolate chips. But if you can’t find them, you could use the peppermint M&M’s. 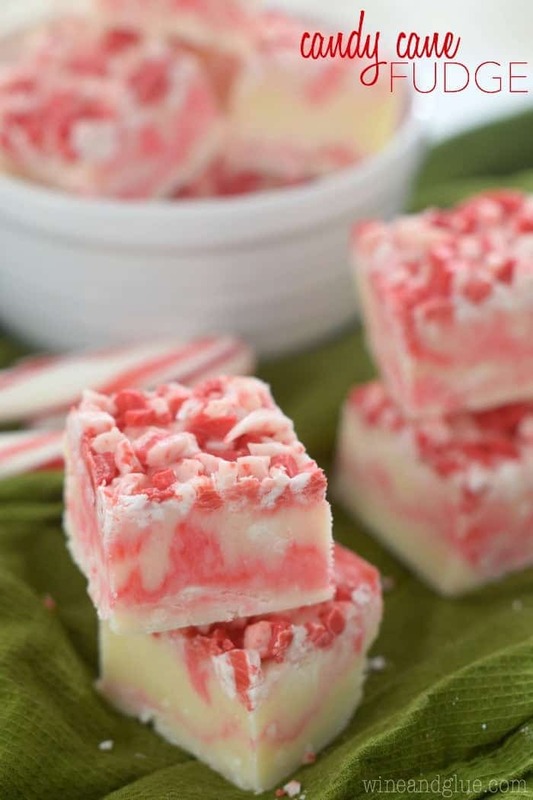 Someone asked if you could use cut up candy canes, and I know some bakers would say do it, but I feel like it will make the texture of the fudge funky. My fudge turned out gooey. Do you have any suggestions? Despite the stickiness, it tastes wonderful! If the ingredients are off a little it will change things greatly. So if there wasn’t enough chocolate that would be a problem. Also, I typically don’t scrape down my sweetened condensed milk can, and that can make difference. Finally, LOTS of people have made the mistake of using evaporated milk and not sweetened condensed milk, and that can make a HUGE difference.